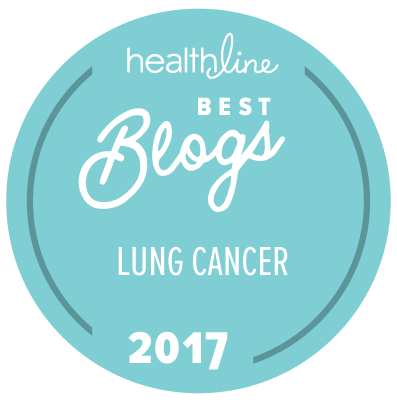 This is reblogged with permission from the LCSM Chat website. The best lung cancer care considers the patient’s goals and values when choosing a treatment. However, identifying and communicating those goals is not always a straightforward process for either the care provider or the patient. This week’s #LCSM Chat explores the process of communicating patient goals and values. Care providers need to know how to elicit them. Patients (even those who want to leave treatment decisions entirely to their doctors) must be able to identify and express them, and, if need be, initiate a conversation about them. Choosing the right treatment and care for a lung cancer patient is a matter of weighing risks of side effects versus evidence that the treatment has a good chance of success. Physical side effects can run the gamut from mildly annoying tummy upset to life-threatening organ failure. Yet sometimes a drug that causes severe side effects might result in cure or prolonged No Evidence of Disease. While the doctor or other care provider can learn about the risks and benefits for specific treatments from medical literature, only the patient knows what risks they are willing to accept to achieve their individual treatment goals. Willingness to tolerate risks varies from patient to patient. Some patients (perhaps those with small children) might favor an aggressive new treatment with the goal of living as long as possible regardless of side effects. Others (perhaps those who have additional health problems that would be dangerously aggravated by cancer treatment) may choose to forego active treatment and aim to be comfortable enough to attend a dear friend’s wedding in six months. In addition to physical side effects, patients also have financial, logistic, cultural and family concerns. Although it would be wonderful if all cancer patients had sufficient resources to access the most effective treatment options and the best care, we know this is not the case. Some patients must make treatment choices based on their ability to pay or to travel to a treatment site–a cancer center may not covered by the patient’s insurance, or may be hundreds of miles away. Unfortunately, bankruptcy is not a rare side effect of cancer treatment. The discussion of patient goals and values must continue throughout a patient’s lung cancer treatment, because patient preferences may change over time. An early stage patient might choose to be aggressive in their first-line treatment in hopes of a cure. Yet that same patient may find that after their cancer has become metastatic and they have had three different aggressive cancer treatments, they hesitate to try another treatment likely to have severe side effects. Some patients are comfortable trusting their doctors to determine whether the potential benefits of a treatment are worth the potential side effects, while other patients prefer to participate in shared decision making. Both approaches are valid choices, but in both cases, one would hope that one’s doctors would consider each patient’s goals and values when weighing treatment options. However, the process each care provider uses to determine patient goals and values is far from standardized. It is not a skill that has been (or is currently) taught in most medical schools. Sometimes the process doesn’t happen. We hope you will join the 2/25 chat. Remember to add the hashtag #LCSM to your tweets during the chat so other chat participants can see them. For more info, check out how to participate in #LCSM Chat. If you can’t join us, please leave your comments below. “Patient-centered: providing care that is respectful of and responsive to in­dividual patient preferences, needs, and values, and ensuring that patient values guide all clinical decisions.” Institute of Medicine, CROSSING THE QUALITY CHASM: A NEW HEALTH SYSTEM FOR THE 21ST CENTURY, p. 3. “Patient-Centered Communication and Shared Decision Making,” National Academies Committee on Improving the Quality of Cancer Care, Delivering High-Quality Cancer Care, Chapter 3. This entry was posted in #LCSM Chat, Advocacy, Lung Cancer, Patient Advocacy and tagged patient values, patient-centered, shared decision making. Bookmark the permalink.